Welcome to the batari Basic Extension for Visual Studio Code which allows users to create games for the Atari 2600 VCS using the batari Basic language. 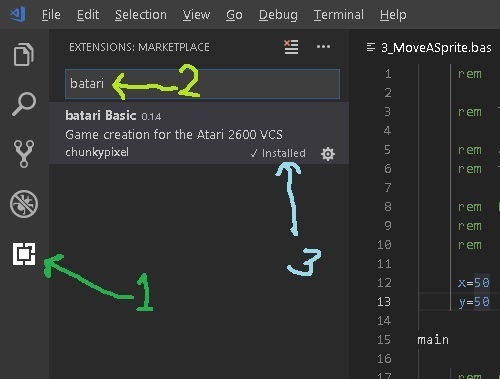 The average person who wants to make an Atari 2600 VCS game no longer has to spend years trying to figure out assembly language thanks to batari Basic! This extension was created and is maintained by mksmith for the AtariAge community and is free to use. If you have paid for this extension please seek a refund. Big thanks to everyone who has helped along the way and to the 60+ users who have so far installed the extension! 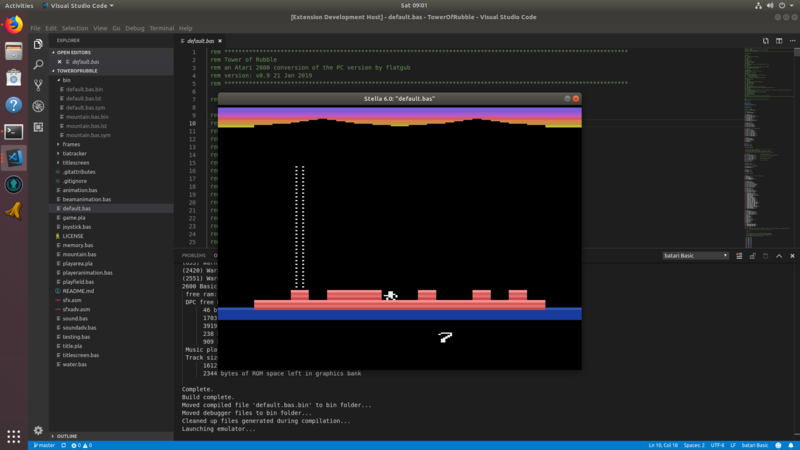 My new extension Atari Dev Studio for Homebrew Development is now available for designing homebrew games for the Atari 8-bit systems (Atari 2600 and 7800). Atari Dev Studio is a one-stop-shop for any programmer and includes a number of built-in features to allow you to design, develop and test games for your favourite system. Get started with batari Basic (2600) or 7800basic (7800) using easy to learn BASIC-like languages or go hard-core with assembly using dasm. During development test your creation using the Stella (2600) or A7800 (7800) emulators right from within Atari Dev Studio. I will continue to do minor updates to this extension for the time being if you wish to continue using this one. batari Basic created by Fred "batari" Quimby is a BASIC style language used in the creation of Atari 2600 games. 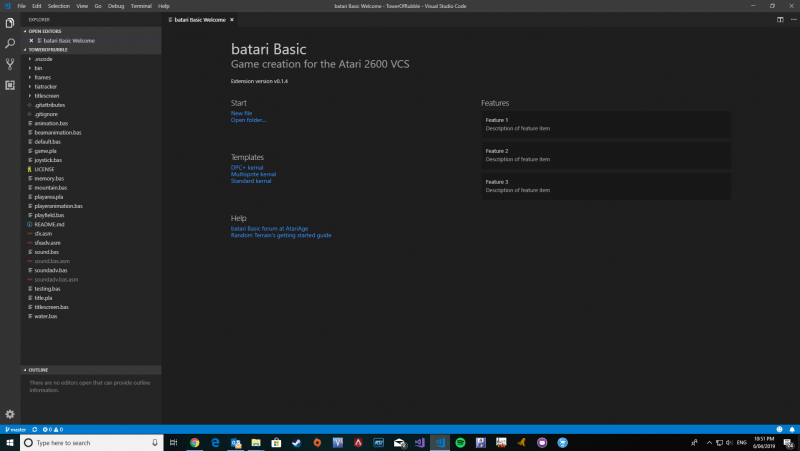 batari Basic is compiled to generate a binary file that can by used on actual Atari 2600 VCS hardware via cartridge (such as a Harmony or UNO cart) or by using an Atari 2600 VCS emulator such as Stella. batari Basic logo created by RevEng (http://atariage.com/...tari-basic-logo). Stella is included as part this extension with many thanks to Stephen Anthony. Stella is a external project and can be downloaded separately here. If you enjoy using Stella place consider donating to ensure it's continued development. This release is compatible with Windows, Linux and macOS. The latest releases of batari Basic (BB.1.1d.reveng41), dasm (2.20.11 - 20171206) and Stella (6.0 - WIndows and Linux only) are included so you can be up and running straight after installing the extension. As noted you can optionally provide links to your own specific releases of batari Basic, dasm and Stella (or other emulators) via the configuration settings. From the Extensions tab, click on the Search Extensions in Marketplace entry box and type batariBasic. Select the extension from the results list and click the Install button. A number of extension configuration options are available via the File > Preferences > Settings > Extensions > batari Basic tab allow you to customise your experience. Note: If you are having trouble using the snippets press CTRL+SHIFT+P to display the command palette and choose the Insert Snippet option. During the development phase of the extension i've added some developer output to assist with any issues that may appear. To view this output, open the Developer Tools using either CTRL+SHIFT+I or Help -> Toggle Developer Tools from the menu and in the debugger window, ensure the Console tab is activated (see image below). This information may help identify the area where the extension is failing to process. Added Stella 6.0 packages for Linux (Debian, 32-bit and 64-bit). macOS will still (for now) be required to provide a path to Stella. 20190413 (Build 0.1.5, 0.1.6) - Preliminary Linux and macOS support! Thanks to TwentySixHundred and Lillapojkenpåön for helping with a couple of compiler/launcher problems. Added debugging information to all processes. To view this output, open the Developer Tools using either CTRL+SHIFT+I or Help -> Toggle Developer Tools from the menu. Edited by mksmith, Today, 7:32 PM. Can you put in similar tools that VbB has? That's awesome, great job on that! 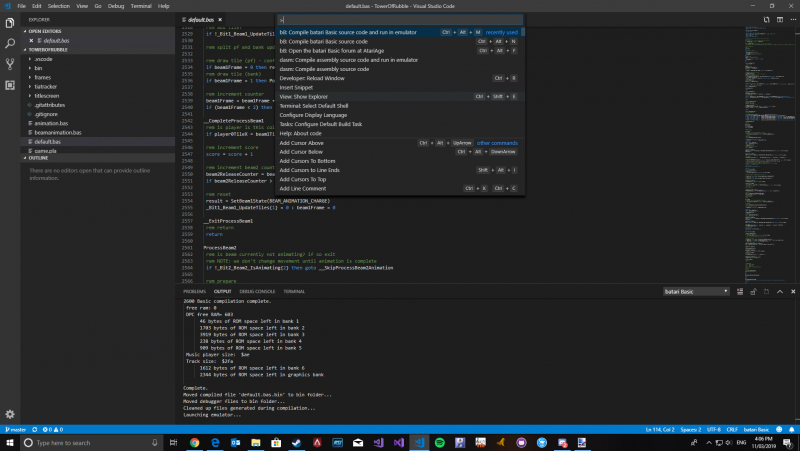 And Visual Studio Code is cross-platform, so it can be used in Windows, macOS and Linux. Microsoft did a nice job with this editor. Are you going to charge for your extension? @Albert - No I don't intend to as it should be a community tool Yes definitely can look at cross-platform compilation as it should just be the case of verifying the OS and adjusting the paths according (I'm on Windows ATM so setup for that currently). Edited by mksmith, Sat Jan 19, 2019 2:53 PM. Very cool, especially the cross-platform nature of it. Well done! snippets (DPC+ kernel template, and the NTSC and PAL60 color tables). There doesn't appear to be a lot of additional stuff that can be added via the Activity Bar ATM. There is some sort of webview you can add to show in a tab (local only) so may need to resort to seeing what can be done there. Did some programming tonight for Tower of Rubble in it and its looking and working nicely. Still reaching for F5 out of habit (VS Code debugger) - you need to go via the command bar (Ctrl+Shift+P) to access features but once there in the list they are very accessible. Edited by mksmith, Mon Jan 21, 2019 6:57 AM. I'd be happy to test / assist if you can walk me through the setup. VbB is great but as others have noted, it becomes really fidgetty when your code gets above a certain size, i find my self using Notepad++ then copying and pasting, hardly ideal! Either Way, I hope this works out as an alternative, look forward to seeing your progress! Definitely interested! Does this also support compiling and running the emulator from the IDE? If this had syntax highlighting for 7800bas and IntyBASIC it would be a %100 percent buy. @Gemintronic - yes you can compile and run if you choose (or just compile). I haven't every looked at 7800bas or IntyBASIC - would need to check those out at some stage. Great - will PM you soon with the details - still working through a few things! Are you on Windows?? Yes, i'm running with Windows 10. You cited limitations with the Visual bB IDE as the imeteus for creating your visual studio extension; how do you plan to handle sprite and playfield GUI's, will you create a colorful integrated GUI for this like Visual bB or use the WYSIWYG ACII art editors already present in bB? 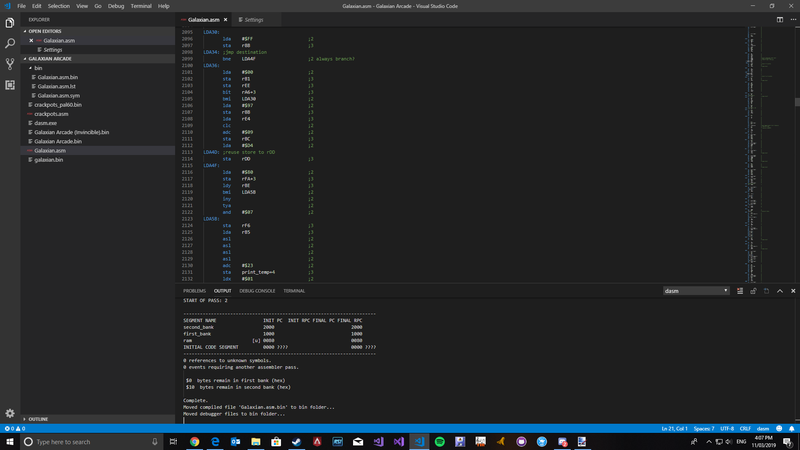 I wrapped the PowerShell ISE simiarly as an IDE for Atari Flashback and SuperCharger BASIC and decided to keep it simple and use the similar ASCII art designers already present in the language. imo the most important feature is pressing Play to compile and launch the BASIC program in the emulator with one click, which I think you already have. What other features will you add or change in your IDE compared to visual bB? Great! I need to look at manual distribution as sometimes when I copy it over to the extension folder it doesn't always run first up. 7800basic and IntyBASIC look to be very similar (I guess how they all work generally) so some sort of extensions would be do-able certainly. All that is required is a syntax definition and a process to call the compiler (and emulator to test) which I have a basic structure for now. Still I would like to get cross-platform compatibility done before starting other ones. One of the difficulties of building IDEs is always the cross platform nature as people enjoy using their own OSes which thankfully VS Code has the basis to provide the very key features. 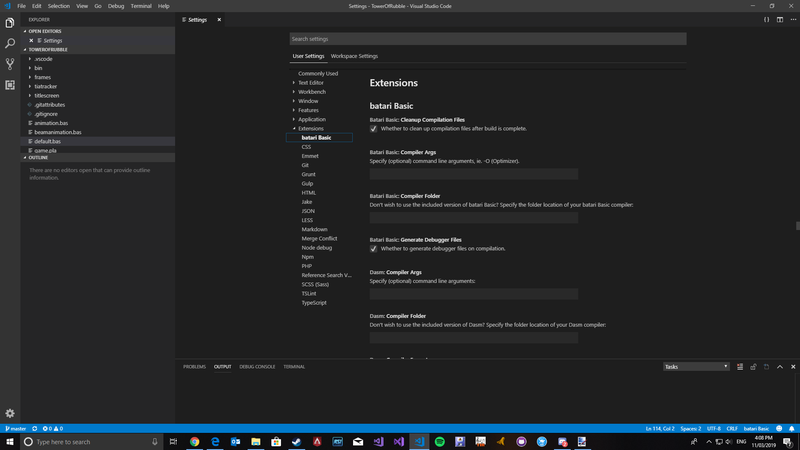 VS Code appears to be limited for GUI development currently due to it's cross-platform nature. There is a webview component with which you can access html locally in the tab so that may be able to do something there but have yet to check that out. 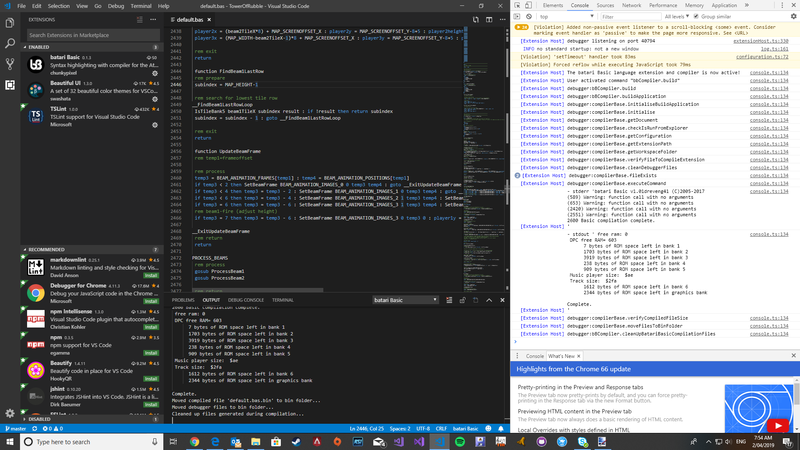 I'm hoping to maybe one day add a language server to compile as you code for syntax checking and also maybe make the intellisense a little more specific but it's got the main stuff required (apart from cross-platform use which would be high on the list). Edited by mksmith, Mon Jan 21, 2019 7:08 PM. Added a dasm compiler into the process as they probably can go hand in hand with developing for the 2600. Re-org'd the code to provide a base compiler class I can override. Back to Tower of Rubble to test the extension! No probs @RandomTerrain - would like to add the charts if a I can as that little tool does come in handy! Might be in a webview document tab if I can get that going. Getting very close to a release. Have a few things to finalise but should be very soon. Can't wait! we are in need of an updated IDE for bB. VbB is brilliant but like others have said there is some issues. Also like mentioned above im interested in 7800BASIC support. It would be great to have an IDE that can support both the 2600 and 7800. Yeah, I won't even try to make anything for the Atari 7800 until I have an IDE. This is a really exciting project. I am a full time software developer that uses Visual Studio all day. This would be a great move for the community. I couldn't make anything without an IDE, so it's been nice having VbB, but one thing that always irritated me about VbB is that it randomly forgets undo/redo. Thank God I use Save As a lot. Once this is complete I'll certainly do a 7800 version as it should be an easy process now to replace the compiler. Ill need to take a closer look in regards to either having one extension or two - certainly all together might be a great way to go. I am unfamiliar with Visual Studio. I will definitely have to check this out. I really like vbB and I don't think I would ever have been able to make anything even resembling a game without it.